The Chapter sponsors One Day meetings held approximately every 2 months (except for the month of the Regional). Meetings are currently held at the Founders Building, 701 South Main, Grapevine, TX. The meetings start at 8:00 AM with a Mart followed by an education program at 11:00 AM. Admission is $10.00 and normally includes a catered lunch at the conclusion of the educational program. 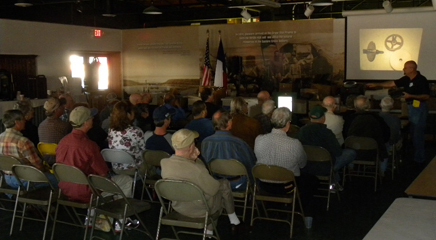 Membership in the NAWCC is required for admission to the Mart; however, anyone may attend the educational programs. Non-NAWCC members may be admitted to the Mart as a guest of a member if they want to see what the NAWCC has to offer. Guests are limited to attendance at one Mart without joining. Contact any of the officers for additional information or if you need a sponsor to enter. 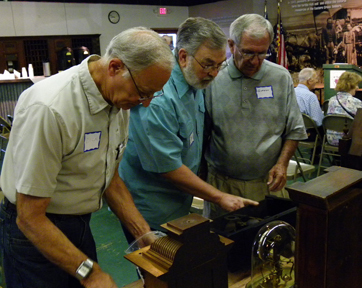 From time to time, the Chapter also sponsors social/educational events held at member's homes. These events are normally free to Chapter members and special guests. Please check the Chapter 124 Calendar for the current One Day meeting and other events schedule.